Posted on July 9, 2009 at 18:36. Hope Industrial Systems is pleased to announce our new full-travel rubber overlay keyboard with button pointer. With 103 keys, 20 function keys, a separate numeric keypad, and button pointer with mouse buttons, it offers all of the functionality required for industrial applications. Cables are routed up through the base of the display, exiting the enclosure along with the video and touch screen cables. 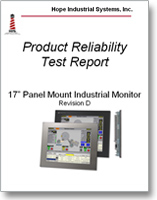 It has been designed to attach to all Hope Industrial Systems Universal Mount monitors with no gap in between the monitor and keyboard and is UL certified to meet NEMA 4 and 4X standards. 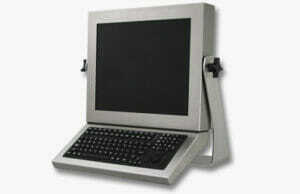 The keyboard is available in PS2 or USB versions and carries a 3-year parts and labor warranty. Posted on October 16, 2008 at 16:41. 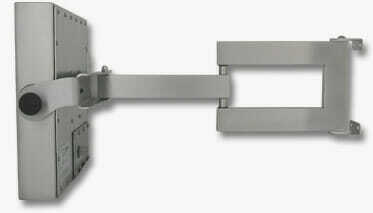 The first stainless steel wall arm that costs less than a Hope Industrial Systems monitor! This new arm is constructed of high quality, heavy-gauge stainless steel, and is designed for industrial environments that demand NEMA 4X certification. Also, it comes with our standard 3-year warranty and 30-day total satisfaction guarantee. Posted on June 1, 2008 at 16:59. 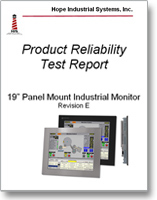 Introducing the New Hope Industrial Systems Industrial Display Blog! Posted on May 20, 2008 at 08:37. 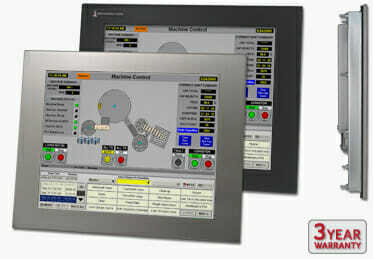 Welcome to News.HopeIndustrial.com, a new service presented by Hope Industrial Systems, Inc. to provide our customers with up-to-date news and information on industrial displays and touchscreens.